Lovely atmosphere and vibe, the food was really good. We’ll soon be back for a meal there. Wonderful people! Had great conversation. Spoke multiple languages. 10/10 recommend! Very warming owners who are really able to make their guests feel comfortable immediately. The food was outstanding! 100% recommendation. Excellent cook and mood in the restaurant. If you want to live the little happyness of Paris that's the place! We went here for Valentine's night and don't regret it! A small intimate restaurant with a lovely friendly welcome from both Jo and Eric, The menu was explained whilst we had an apero and when the food arrived it was lovely including the best cooked lamb I have had in ages. Highly recommended but you must book! 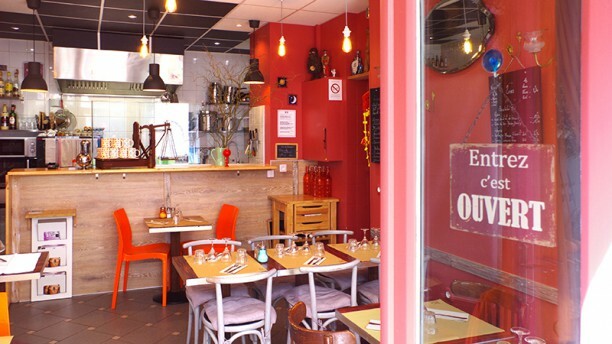 An excellent restaurant with a perfect, genuine french cuisine. Very nice place, warmly recommended ! Nice and cosy place. Hosts are really friendly and welcoming. Tasty food too! Thanks to you both. Hope to see you again when you'l be back ! Jo and Eric are very welcoming and friendly. They have created a cosy resraurant with excellent frech food. Our dinner was perfect in every possible way. We had a wonderful last evening in Paris and can therefore highly recommend! Thanks to you for coming. It was a pleasure to welcome you in our restaurant. See you next time in Paris. ... and a very nice time with you ! Food was very good - tasty and plentiful. Excellent desserts. Had a great cosy atmosphere. Superb fresh menu which changes almost daily. Restaurant sits about 18 people and is perfect for a wonderful ambience. Both proprietors were friendly, funny and clearly passionate about their dishes. An absolute must visit! Including half a bottle of house wine and a three course meal, the price was about 50 euros for two of us (with the la fourchette discount) - excellent value. Thank to you for coming. It was a great saturday night ambience. Hope to see you soon. On vous informe directement quand il y aura de la tête de veau, des rognons, de la langue de bœuf voire des ris de veau !!! Cette semaine, ce sera pot au feu à la joue de bœuf ... A très vite et merci à vous trois de votre charmante visite. Merci à vous deux pour ce moment passé en votre compagnie et à très bientôt. Vous étiez six amateurs de bonne cuisine. Ce fut un plaisir de partager avec vous sur ce sujet. 7 à table, ce fut une belle soirée que de vos voir tous manger avec un bel appétit.